Rice Krispies are not gluten free. The only ingredient that makes them unsafe is 'malt flavoring', that and Kellogg's do not make any products that are gluten free. Hey Kellogg's, take a hint from General Mills! Who cares though, because there are a few gluten free krispies alternatives. I used Nature's Path Crispy Rice, but I sometimes use the chocolate Koala Crisps. Both are delicious options. Kraft Marshmallows are gluten free. 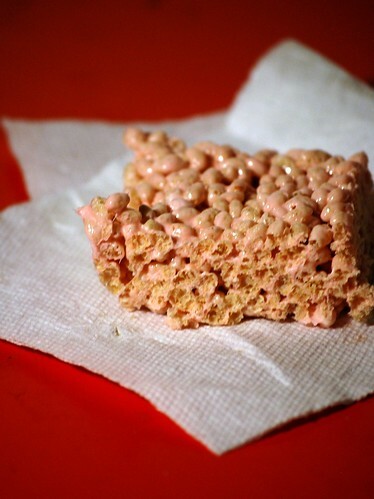 All you need for rice crispy treats are most of a box of crispy cereal, a bag of marshmallows, and a little butter. They're pink today because I used strawberry marshmallows, which are delicious! Lightly grease a 13x9 pan and set aside. Melt butter, then add marshmallows. Stir until smooth, remove from heat, and stir in the cereal. Spread in the pan and pat down with a lightly greased spatula. Cool and eat, not all at once if you can help it. *I like to use less cereal sometimes so everything is more marshmallow-y. That's a word, right? I use Barbara's Brown Rice Crisps, and throw in a handful of chocolate chips after the butter and marshmallows have been melted. This is my "dessert" of choice to take to a potluck! i haven't had rice crispy treats in ages. i bet the chocolate cereal is great. 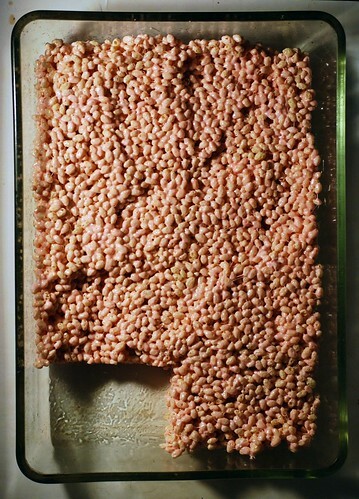 I bought some Nature's Path brown rice crispy cereal a while back and made peanut buttery rice krispy treats. I should make them again - yum! Love your pink ones. I use General Mill Rice Chex to make rice chex treats! It is even better than the rice crispies!